A new crop of financial technology – fintech – companies are finding ways to cut costs for migrant workers sending money back home. Migrant workers in the Gulf collectively spend hundreds of thousands, if not millions, of dollars each year on transfer fees to send money back home. The typical options for sending money overseas, such as Western Union, money exchanges, bank transfers (or the illegal but popular hundi or hawala system), can be extremely costly even for relatively small sums of money. But a new crop of financial technology – fintech – companies are finding ways to cut costs for migrant workers. Fintech companies provide services such as online banking, or payment services that allow customers to move their money across borders with just a tap on their smartphone. Some people in the business believe that fintechs will eventually shake up the traditional banking industry in the same way that Uber or Careem have transformed taxis, or Netflix has changed TV watching habits. Globally, migrant workers remitted $575 billion in 2016, $429 billion of which went to developing countries according to the World Bank. But in many cases, the high costs of sending money eats into workers’ salaries, leaving less for their families and communities back home. Whether it is intended for their children’s education, an elderly relative’s healthcare, buying land or securing some other dream, the prospect of earning more money is at the heart of most migrant workers’ decision to go to the Gulf. But ironically, migrant workers find themselves on the fringes of the financial system in most of the Gulf countries. Even if they are legal, documented migrants, there are very few financial services available to them, and the ones that are on offer tend to be expensive and inconvenient (although some notable exceptions have emerged in recent years). For a start, conventional bank accounts in the UAE are not set up with low-wage migrant workers in mind. Most require customers to maintain a monthly balance of at least AED3000 (roughly US$800), according to UAE price comparison site Souqalmal. This is at least twice the average monthly salary of a domestic worker in Dubai, and therefore well beyond the reach of most migrant workers. Under the Wage Protection System, migrant workers are supposed to receive their salary via one of the designated service providers – through bank accounts, prepaid cards or money exchanges. It would cost a migrant worker in the UAE sending AED 735 (US$200) in cash to Nepal an average of AED 31.43 (US$8.55) in transfer fees, according to data compiled by the World Bank in July 2018 as part of its Remittance Prices Worldwide initiative, which collects data on certain remittance “corridors” with the aim of bringing some transparency to the question of money transfer fees, particularly where lower-waged workers are concerned. Sending QAR 730 (around US$200) from Qatar to Nepal would cost an average of 32.38 QAR (US$8.84) while sending SAR 750 (US$200) from Saudi Arabia to the Philippines would cost SAR 43.54 ($11.61). If the cost of sending remittances could be brought down by just 5 percentage points of the value of each transaction, then recipients of money in the developing world would receive $16 billion more each year than they currently do, according to the World Bank’s calculations. There are a whole host of reasons why money transfers are so expensive for migrant workers – under-developed financial infrastructure, lack of competition and lack of transparency, according to the World Bank. The fact that migrant workers may struggle to get together the correct documents to use regular financial services can also be a barrier. NOW Money, a UAE-based company that provides remittances services for unbanked migrant workers via a mobile phone app, is one of the companies trying to do things differently. Set up in 2015 by entrepreneurs Ian Dillon and Katharine Budd, NOW Money provides both mobile accounts and mobile money transfer services for migrant workers. The majority of migrant workers in the UAE have mobile phones, and workers from India and Pakistan, in particular, are already familiar with the concept of mobile money transfers because these services are widespread in their home countries, Travers said. 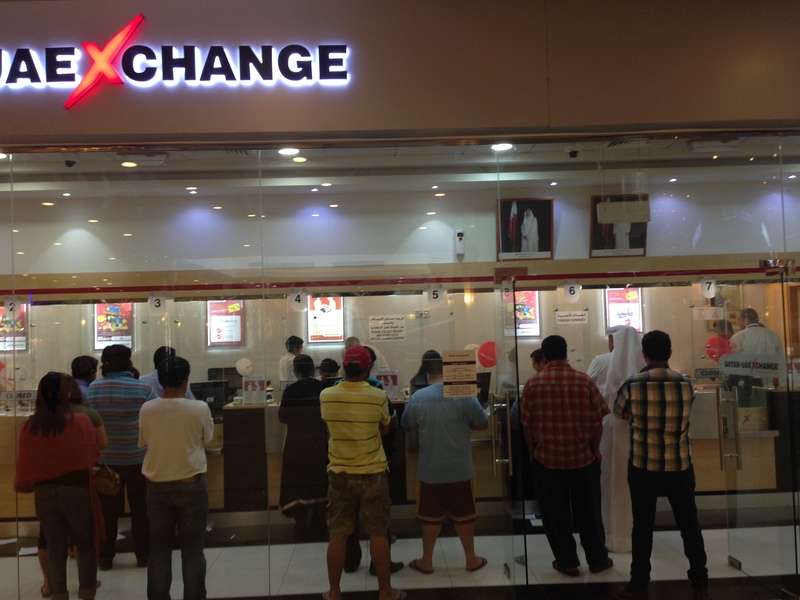 “If one exchange house is a fraction of dirham cheaper than another exchange house, migrant workers will trust another worker to take their cash to the cheaper exchange house even if it's a long way away,” Travers said. Apart from current accounts and payments, NOW Money sees gaps in the market for loans and for insurance of remittances, she added. Other fintech companies in the Gulf are starting to come forward with financial services aimed specifically at migrant workers. Dubai-based startup Democrance provides mobile insurance to people who might otherwise struggle to afford protection, while Rise provides mobile financial services (including savings and micro investments) targeted at nannies in the UAE. Canadian-based money transfer firm Remitr is also active in the UAE with an online money transfer service that enables customers to send money to India cheaply and conveniently (although the service appears to be focused more on a middle-class professional customer base, rather than lower-waged expats). RemitNow, also based in the UAE, is a fintech startup that provides mobile tech solutions to enable other financial institutions (for example, conventional banks) to create digital financial products that will promote inclusion. Qatar-based Ooredoo, a telecoms company, has offered mobile money services since 2010, and has operations across the Gulf, North Africa and certain Asian countries including Myanmar and the Maldives. While the mobile money product is not explicitly marketed as being for unbanked migrant workers, it does solve a number of the problems that migrant workers would face when managing their money. Signing up for a mobile money wallet requires no minimum balance, and money transfers can be done directly from a mobile phone, with no need to visit a bank branch or broker. Bringing in a financial literacy angle, UAE-based Rise provides mobile bank accounts targeted at migrant workers in the UAE, with no minimum balance. It also provides customers with tools to build up a credit score and get access to a range of lending and savings products. Padmini Gupta, the CEO, said the company has also been carrying out a social media campaign to get the employers of domestic workers in the UAE to understand the importance of financial literacy and planning for migrant workers. Cost-conscious migrant workers sending money back home are facing another challenge in the Gulf: remittance taxes. The Kuwaiti government gave the go-ahead for the controversial remittance tax in April 2018, which imposes a levy of 1% on transactions of up to KD99 (US$300), 2% on transactions of KD100 to KD299, and 3% for transfers of KD300 to KD499. This would be in addition to the usual commissions and fees charged by banks and brokers. Kuwait decided on the tax supposedly to encourage expat workers to spend more money in the country rather than sending it home. However, the government then went on to rescind the tax just months later in July 2018. This is something of a paradox given that low-waged migrant workers tend to keep spending to a minimum when they are in the Gulf countries, instead choosing to remit as much money home as possible. The UAE is understood to be considering a similar tax. The Saudi finance ministry has denied rumours circulating about plans to remittance tax, while Bahraini members of parliament shot down plans to bring in a remittance tax back in May. Oman does not currently have a remittance tax, but it did tighten up scrutiny of transactions to overseas countries in 2018: the Ministry of Finance introduced a scheme called Enhanced Due Diligence, under which transactions over OMR400 ($1,037 as per January 2019 exchange rate) would come under additional scrutiny in a bid to crack down on money laundering.